Here it is. A Banana Pi running an Open-Xchange AppSuite on a 8 GB SD card. 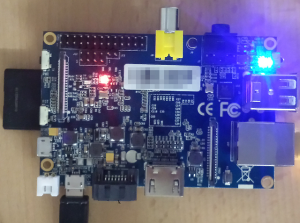 As the Raspberry Pi does not support ARMv7 I had to use the Banana Pi instead. Not too bad as this device is more powerful and better to run a Java backend, a MySQL database and the Apache web server. For mail I’m using an existing mail account in the cloud. You have to make a few modifications as officially only 32-bit systems are supported. This means the OS architecture check and all office related repositories must be commented out.